SATEC's Branch Feeder Monitor™ BFM136 is the next generation energy management metering for multi-tenant power solutions. The BFM136 monitors up to 12 three phase circuits or 36 single phase circuits, or any combination of single or three phase circuits. This flexibility makes the BFM136 perfect for multi-tenant facilities such as residential projects, office buildings and shopping malls. This compact instrument is designed to easily fit into existing panel boards or be flush mounted nearby, thus eliminating the need for expensive retrofit projects or for allocating extra space for the device. 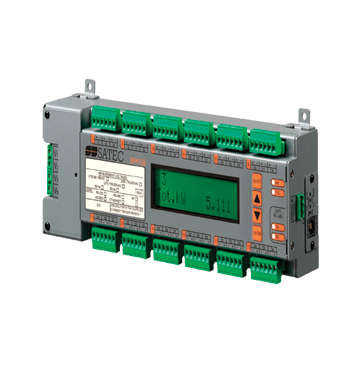 The BFM136 monitors up to 36 currents via external Current Transformers (CTs). Each CT measures and reports the current consumed by each of the branch circuits at the panel board. For billing purposes, single or multiple circuits can be defined for each customer. This flexibility allows a simple reassignment of circuit groups without wiring changes, and allows for easy changes when tenants move in and out. Main panel board or load center installation makes for a valuable saving of both time and money. The BFM136’s user-defined and easily configured alarm system enables users to take predictive maintenance action in order to avoid unnecessary outages.